Among the "smoking guns" unearthed by Ganser is a Pentagon document, Field Manual FM 30-31B, which details the methodology for launching terrorist attacks in nations that "do not react with sufficient effectiveness" against "communist subversion." Ironically, the manual states that the most dangerous moment comes when leftist groups "renounce the use of force" and embrace the democratic process. It is then that "U.S. army intelligence must have the means of launching special operations which will convince Host Country Governments and public opinion of the reality of the insurgent danger." Naturally, these peace-throttling "special operations must remain strictly secret," the document warns. The hearing record includes a facsimile of the manual which matches that on Cryptome referenced above except for the word "FORGERY" stamped in large type on each page, including the alleged note to Philippines President Marcos. The hearing record also includes a copy of the Covert Action Information Bulletin (below) which published FM 30-31B in 1979 along with an assessment of its authenticity: "Regardless of the dispute, we believe, as do publishers in several other countries already, that the document is real, and that in any event our readers should see it and decide for themselves." 2. The CIA's testimony appears to closely follow the CovertAction analysis to offer counters to it, point by point, but does not offer evidence, at least not in the published versions, to support the claim of forgery, only unsupported assertions. Also present: Thomas K. Latimer, staff director; Michael J. O'Neil, chief counsel; Patrick G. Long, associate counsel; Jeannie McNally, clerk of the committee; and Herbert Romerstein and G. Elizabeth Keyes, professional staff members. Mr. ASPIN. The purpose of today's hearings is to apprise the committee of the Soviet use of propaganda and covert action against the United States in the formation of foreign policy, and the particular focus of today's hearing is going to be on forgeries as part of the use of Soviet covert action machinery,. Mr. ASHBROOK. Well, really not a major statement, I would just like to join the chairman in welcoming John McMahon and his associates. I point out that in recent years I've have heard much in the papers, Congress and elsewhere about CIA covert action, but rarely do we hear much about what the KGB is doing, and what is happening out there in the real world you gentlemen have to deal with. Mr. Aspin has called this hearing and we have worked it out with the idea in mind of giving you an opportunity to tell us a little bit about what goes on out there in the real world, about an adversary that is not constrained by congressional oversight or even the kind of Western morality that most of us advocate. So why don't you start, Mr. McMahon, and develop your presentation in any way you want. I am pleased to have this opportunity today to respond to the subcommittee's request and that of Mr. Ashbrook for the testimony by the Central Intelligence Agency regarding the aims, scope and methods of Soviet propaganda and covert action against the United States. I have brought with me some officers from the Agency who know this subject well. Mr. Ramsdale, who you know already, and Mr. Portman who is a specialist in Soviet covert action. I also have Mr. Benjamin who is a specialist on Soviet forgeries, and Mr. Peek is a technical specialist in forged documents. I have prepared a short opening statement which gives an overview of Soviet policy and practice in the field of propaganda and covert action. I am also providing the subcommittee with a detailed study of the subject I will be discussing today. That study contains actual case illustrations of Soviet policy in action which have been taken from our files in the CIA. Soviet propaganda, for example, may be used to extol the virtues of communism and condemn the vices of capitalism, but it can be and usually is tailored to the specific objectives of the Soviet state's foreign and defense policy objectives. As a case in point, I would cite the 1977-78 campaign by the Soviet Union and its allies against the United States enhanced radiation weapon, or neutron bomb, and the more recent assault on NATO's efforts to increase its longer-range theater nuclear force, TNF, capabilities which began in late 1979. Covert political action and paramilitary activity are also regularly undertaken by Moscow. Clandestine interference in the affairs of a Third World government that brings a pro-Soviet Marxist regime to power, or arms delivered to a national liberation organization may be defended in Moscow on the grounds of promoting the U.S.S.R.'s revolutionary ideals, but the Kremlin also views such actions as contributing to the defeat of international imperialism and the enhancement of the Soviet state's power and influence. In fact, the very term which the Soviets use to describe covert action operations -- active measures, Russian, aktivnyye meropriyatiya -- denotes the essentially offensive purpose of such operations and is used to distinguish them from the more defensive objectives of regular intelligence collection and the counterintelligence functions of the Soviet Committee for State Security, KGB. Soviet policymaking: The enormous concentration of political power at the top of the Soviet hierarchy and the institutional arrangements that exist for formulating and implementing policy facilitate the use of propaganda and covert action as instruments of foreign affairs. Major policy decisions are made at the apex of the political system, in the Politburo of the Central Committee of the Communist Party. The Politburo approves the major themes of Soviet propaganda and reviews potentially, sensitive covert action operations. Under the Politburo's guidance, other party and government organizations play important operational and coordinating roles. These organizations include the Central Committee's International and International Information Departments, and the KGB. I have made available for hand-out a box chart of this policy organization under the Politburo which is available for you. These organizations are supervised directly by the Politburo itself and are answerable only to the top leadership. General Secretary Brezhnev and senior Secretary Suslov, who sit on the Politburo, oversee the two Central Committee Departments. Boris Ponomarev, another party Secretary and a Candidate Member of the Politburo, has day-to-day responsibility for managing the International Department, and considerable influence over the other one. Yuriy Andropov, Chief of the KGB, is a full Member of the Politburo. This leadership structure enhances the Politburo's capability for integrating and coordinating foreign propaganda and covert action with the broader goals of Soviet. foreign policy. The International Information Department of the CPSU is the directing center of the Soviet propaganda effort. It was established in March 1978 as a direct result of a Central Committee decision to reorganize the entire foreign propaganda apparatus, improve its effectiveness, and open a new propaganda offensive against the West. In effect, creation of this new organization signaled the top leadership's desire to place even greater emphasis on the role of propaganda in Soviet foreign po]icy and to increase centralized control and coordination over the entire Soviet propaganda network, insuring that the network is fully responsive to the demands of top policymakers and can be quickly mobilized to disseminate selected propaganda themes on a worldwide basis. The IID is headed by Leonid Zamyatin, former Director of the Soviet news agency Tass and a Brezhnev protege. Zamyatin is directly responsible to Brezhnev and the Politburo. The former Soviet Ambassador to West Germany, Valentin Falin, is the First Deputy Chief of the IID. The CPSU International Department maintains liaison with many foreign organizations that are frequently used to disseminate Soviet propaganda and views on international affairs. Those organizations include more than 70 pro-Soviet Communist Parties, international front groups, and "national liberation" movements. The KGB provides a nonattributable adjunct to the overt Soviet propaganda network. Service A of the KGB's First Chief Directorate plans, coordinates and supports operations which are designed to back-stop overt Soviet propaganda using such devices of covert action as forgeries, printed press articles, planted rumors, disinformation, and controlled information media. In the early 1970's, this section of the KGB was upgraded from department to service status, an indication of its increased importance. Service A maintains liaison with its counterparts in the Cuban and East European services and coordinates its overall program with theirs. For a brief period in the mid-1970's, the Soviets reduced and then curtailed altogether their production of anti-U.S. forgeries. In 1976 however, they resumed using forgeries as an integral part of their covert action program, and major new forgeries have been appearing since then at a rate of four to five per year. Not only has the number of forgeries increased m recent years, but there also have been qualitative changes as well. The new spate of bogus documents includes high qualIty, technically sophisticated falsifications of a caliber which the Soviet and bloc intelligence services were evidently incapable of producing in the 1950's and even in the 1960's. The new forgeries are realistic enough to allow the Soviets to plant them in the western non-communist media with a reasonable expectation that they will be considered genuine by all but the most skeptical of recipients. These forgeries are intended to serve important strategic and tactical objectives of Soviet foreign policy, and they are designed to damage U.S. foreign and defense policies, often in very specific ways. Moscow's intensified use of forgeries appears to be aimed mainly at the United States and U.S. security relations in Europe rather than at our allies per se. We have no knowledge of forgeries being used, for example, against the interests of Western European governments outside the NATO context. The Soviets are probably trying to play upon perceived differences between the United States and the West Europeans while at the same time they wish to preserve the less damaged relations they have with the latter. Overt propaganda and covert action are basic weapons in Moscow's foreign policy arsenal, and they are frequently employed in conjunction with traditional diplomatic methods to advance Soviet goals in the international arena. Those goals may be based primarily on ideological considerations, promoting "anti-imperialism", creating Soviet-style regimes, or on Soviet national security interests or some combination of the two, but ultimately they are intended to enhance the USSR's power and influence in world politics. Policy decisions on major propaganda themes and campaigns are made, or at least approved, by the top Soviet leadership. When we come across evidence of new propaganda initiatives, we can be reasonably certain that some lower-level echelon of the Soviet bureaucracy is not "doing its own thing" without the knowledge of the Politburo-level officials, and that key Soviet leaders regard such initiatives as an important element in their total foreign policy operations. The scope and intensity of the Soviet propaganda activities have varied over time, but Moscow has been remarkably consistent in using time-tested techniques to shape foreign elite and public perceptions and to influence other countries' internal political processes. We believe that the ebb and flow results from temporary tactical adjustments and a availability or lack of opportunities. We also believe that there is an upswing in the level of Soviet activity at the present time, reflecting Moscow's perception that it has entered a new phase of relations with Washington that requires sharper ideological conflict and tougher tactics. Mr. McMAHON. With the committee's permission, Mr. Chairman, I would like to place into the record the text of a study on Soviet covert action. The staff has this paper. Is it the general position of CIA that you stop at the water's edge, and if there are questions about it, you can handle them, or what do you have as a position as it relates to the Soviet use of Americans to implement these goals and objectives? Mr. McMAHON. We don't draw a blank, sir. If the trail leads here, and it looks as if a person is an agent as opposed to an unwitting person who will often replay a story or a newspaperman will get a story. Mr. ASHBROOK. But you obviously don't sit there with a compartmentalized mind and say, all this is going on and I see what is going on until it gets to this country and then I say stop. Mr. PORTMAN. We just aren't out primarily collecting information on what is going on in the United States; so most of the body of our information concerns their activities abroad. Mr. ASHBROOK. Well, let's take a specific example and see where the trail leads and if it is a dead end. You identified the World Peace Council as the largest of the major Soviet front groups used in propaganda campaigns. Is that correct? Mr. AsHBROOK. I just wondered where you stopped insofar as your interest. And I just have one more quick question, and maybe I will take a second round because I would like to tell the chairman that I have not had time to review this, and I am sure he hasn't, and possibly sometime we will want to go through some of the contents, particularly some of these forgeries. Mr. McMAHON. Yes; the author of the El Triunfo article, Fernando Gonzalez, is a known member of the Spanish Communist Party who has been active in assorted Marxist causes, and continues to maintain a close contact with the Soviet Embassy in Madrid, particularly with Boris Grigoriyevich Karpov who has been involved with the KGB. Additionally, copies of the Gonzalez article were distributed to El Triunfo and various other Spanish publications by Luis Gonzalez Verdecia, a Cuban Embassy official and a known member of the Cuban Intelligence Service (DGI). The role of the Cuban DGI in the affair is consistent with Castro's actions on behalf of Soviet policy objectives regarding Spain. Mr. RAMSDALE. I would say, Congressman, that we did have a meeting with representatives of the Department of State, ICA, and the Department of Defense, and discussed the forgery offensive. We discussed in some detail FM-30-31B, called their attention to the existence of it as a forgery, gave them our analytical approach as to how we could prove it was a forgery, and in effect left to them the follow-up measures. But they were aware of what the situation was. I don't believe we had the FBI at that meeting. Do people in the executive branch ever try to come up with legislation to combat our adversaries. Shouldn't we spend a little time and attention thinking of ways we could, without stifling free speech, prevent those people from sending that out? Mr. ASHBROOK. Well, I just think all the other things that are banned from the mails, such as obscenity. As far as standing up and making a speech, I don't think there is any way you can prevent Agee from standing up and speaking or the World Peace Council through its affiliate from propagandizing this country, but do we have to sit back while they use the U.S. mail to send forgeries or things like that? If we are still around, I'ill take a second round of questions, but I have taken more than double my time. Thank You. Mr. ASPIN. You said, for a brief period in the mid-1970's, the Soviets reduced and then curtailed altogether the production of anti-U.S. forgeries. Mr. McMAHON. Why don't I ask Mr. Benjamin. What was going on or what was not going on ? Mr. BENJAMIN. Indirectly. We have some thoughts on this. In the early 1970's, the high point of detente, from the Soviet point of view, things were going good. Things went well until about the winter of 1975-76, when suspicions began to grow on both sides -- on our side, because of events in Portugal and Angola, on their side because of displeasure with the way arms control negotiations were going. So, we assumed that there was a reevaluation from the Soviet perspective in that period, that things weren't going their way and perhaps it was time for them to engage in more direct ideological conflict with the United States. Mr. ASPIN. Can you go back before the early 1970's, then ? What has the history been of the use of forgeries before then, I mean, if there was a pause, in that period and then an increase since. Fill me in from World War II. Basically what happened? Mr. BENJAMIN. As a rule, or as sort of a gross number, we say there have been about 150 forgeries in the whole post-war period. They really began making forgeries in a very crude way in the late 1950's, and by crude I mean the forgeries were crude, the methods of surfacing them were crude. For example, they would manufacture statements by Secretary of State Du]les, which would be written in German and then translated into poor English. The Soviets would then publish the English and German side by side in an East German newspaper. Well, that didn't fool anybody. Or they would use some rag in the Third World to surface these things. Between the late 1950's and mid to late 1960's, we have been able to document about 50 documentary forgeries, not phony bank account statements and things like that, but documentary forgeries. Soviet forgeries for the Third World is a whole different story. Things were going great funs there all through the 1960's. Most of this business was farmed out to the Czechs, for example, in Africa. They had specific purposes for compromising the Peace Corps, or they would be targeted on a particular Ambassador that the SovIets didn't like, that sort of thing. But as a rule this peters out. This peters out in the early 1970's, and for a period of from roughly 1972 to 1975 we have no example of a major new forgery. But there were one or two straws in the wind. There is a precedent for the standdown during a period of high detente -- we cite this in our study. I am not sure of the exact dates, but In the months preceding the abortive Khrushchev-Eisenhower summit in Paris which blew up over the U-2 affair, there was clearly a standdown in a period which had otherwise been characterized by high intensity use of forgeries. There was a clear standdown in the use of forgeries in the months preceding the summit, in May 1960, and after the summit the activity rose again to its previous high level. Mr. BENJAMIN. Precisely. These intelligence activities which occur in what we call the demimonde, which may be forgeries, harassing journalists in Moscow, things like that, they serve as a barometer of the general atmosphere of Soviet-American relations. From an analyst's point of view, that is their primary purpose. And also, I think you have to say that even though during this period in the mid-1970's when there weren't any major forgeries, most of the other types of covert action that we are talking about did go on. There was a selective standdown in an area that was or perhaps a higher risk from their point of view of interfering with the detente policies. Mr. RAMSDALE. I would also add one point. Mr. McMahon is absolutely right. That is, looking at Soviet doctrine, Marxist-Leninist doctrine. During times of detente you see no abatement of the ideological offensive and on that basis you would not anticipate seeing a change in their covert action posture, at least most aspects of it. You might see a slowing down of paramilitary action, or you might see something else when there is a hot war prospect, but I don't think you would see the CA sword put back in the sheath. Mr. ASPIN. Let me just ask one more question, and then I will turn it over to Bill, and that has to do with -- you are talking about here -- I have not looked at the stuff in the folder here, but you have here for example, the forgeries which, since 1976, fall into three groups and I am talking about that single forgery, the bogus U.S. Army field manual it says here, exploited repeatedly, to support unfounded allegations that the United States acts as the agent-provocateur behind the various foreign terrorists, and particularly the Italian Red Brigades. I would have thought on the fact that that would be a tough thing to show. I mean, is that really what they are using the thing for? Are they convincing anybody of that? Mr. PORTMAN. They are convincing a lot of people not only in the Third World but in some of the Western countries, too. Basically that forgery tries to show two things. It is a detailed field manual at a top secret level that General Westmoreland supposedly was to have assigned at the time that the Soviets put it out. One message states that the military and civilian security intelligence services of the United States, when they maintain liaisons abroad, use this as a cover to penetrate and manipulate the foreign governments. The second big message states that the United States establishes relationships with what appear to be leftist organizations and manipulates them in order to try to discredit communism and left-wing organizations. It is on this latter point that the Soviets then made accusations at the time that Aldo Moro was murdered in Italy -- that the initial response of the Italian and the Western press was that it was the Red Brigades who murdered Moro, and the Red Brigades were far leftists who had ties with the Soviet Union. Stories cIrculated in Italy at the time that these Red Brigade members were trained in Czechoslovakia. The Soviets then, in reaction to this, among other things placed an article in the World Marxist Review, which is also called the Problems of Peace and Socialism, which is their international Communist journal. The Soviets wrote an article analyzing the situation in which they said that it was CIA that was secretly manipulating the Red Brigades who murdered Aldo Moro, the Soviets then cited the phony field manual as proof of this charge, because this field manual supposedly instructs CIA and the other services to get out and manipulate leftist organizations. So in this case the forgery was used to reinforce their allegation. The Soviet charge was picked up in some of the Italian press; a couple, of the newspapers questioned it, but there were three or four of them that didn't. Mr. ASPIN. What about the two other examples that you have got there? You don't say very much here in the statement, but the series of forgeries which now totals eight, aimed at compromising the United States in Western Europe and provoking discord in the NATO Alliance, especially in the context of the Greek-Turkish dispute, what specifically are they doing there, and what is going on ? Mr. PORTMAN. This is not a Soviet campaign in and of itself. Forged documents are only used by the Soviets, as we have said, to in effect reinforce an aspect of other overt parts of their policy, diplomatic activity, propaganda and the rest of it. So we see during this period from, let's say, mid to late 1976 to the present, a series of forgeries appearing in Western Europe or around the NATO question, which are used to try to pick at the suspected weak points that we have. Mr. ASPIN. Well, tell me just briefly, without going into each example, what is the thrust? I mean, I can't tell from what you have written here. Mr. PORTMAN. These, individual forgeries are not coherent in and of themselves. I mean, all of them don't tie together. They hit different aspects. Mr. YOUNG. What do we do about a forgery like the "President's speech"? Whatever we do, do we do it surreptitiously? Do you call up the Prime Minister and tell him, or do we go public? What do we do? How do we handle that ? Mr. YOUNG. But in the case of the "President's speech" that you said was published in several Greek journals, then did you go public with some type of a story in a similar publication? One other aspect that has come, up recently, to get back to an earlier question from Representative Ashbrook. The Soviets have prompted some of their foreign news contacts -- particularly this came up in the field manual where it appeared in so many countries -- to contact some persons in the United States to get conflicting statements. Former Air Force Colonel Prouty, Agee himself, and a couple of others, were contacted .by some foreign journalists. They were told that the U.S. Government has denied that this field manual is an authentic document; what do you think? These people then made statements saying: Well, I don't know specifically, but according to my experience the U.S. Government does this type of thing, and so forth. Mr. McMAHON. It comes back to our basic assessment of the Soviets. They are always after us. They are relentless. What we are saying about the forgeries is: Sometimes the Soviets use them and sometimes they don't, but when you look at the $3.3 billion program of covert action and propaganda targeted against the United States, the Soviets are constant. So, the forgeries are really not that significant in this context. And I really think the Soviets are seizing an opportunity. It is just like Radio Baku when Iran started to go to pieces and the Soviets started broadcasting. Radio Baku was bitter and vitrolic against the United States and inciting the Iranians against the United States. What the United States did was call in Dobrynin and asked that they cease. Well, they did. The radio tuned down somewhat right after that. Mr. PORTMAN. There's probably two parallel levels here. Each one of these forgeries, as we said, is a tactical move in a larger campaign, but at this particular time it would be useful to surface this particular forgery to reinforce what we -- the Soviets -- are trying to accomplish in this campaign. Mr. McMAHON. I think you will find many views. It was obvious that the Soviets did not think there would be the world reaction that there was. I think they just underestimated everyone's reaction, including ours. Now, this is a very provocative statement. I wouldn't go so far myself as to say that that was the reason they moved into Afghanistan. I think the reason has to do with their own security interests on their border and instability, which they can't tolerate there. But yes, they take advantage across the board, in various ways, of any of these things that occur. Mr. BOLAND. I notice that listed on tIle expenditures of the $3.3 billion, you have got Tass for $550 million. You have got Pravda, $250 million, and Izvestsia for $200 million. I don't know whether or not they ought to be included. Should they? They are just propaganda papers any how for thee Russian Government, aren't they? Mr. PEEK. I would say the field manual 30-31B was the most successful because they have replayed it in many different countries, in fact in practically every continent in the world, and it was played in the press. Some of their other campaigns went to governmental figures. Their campaign in the Mideast against President Sadat was probably counterproductive because the Egyptian Government is now fully aware of who is doing the forgeries, and when the last one appeared, they reacted immediately, saying this has to be a forgery. Mr. BOLAND. What did the last one say ? Was that the interview with Mondale ? Mr. PEEK. No, it is the, third forgery using the name of Herman F. Eiles on it. This is a letter to Admiral Turner which was also surfaced in Damascus. Mr. BOLAND. Well, the interview with Mondale wasn't very destructive, was it? He only, it seems to me as I try to read it here, part of it, it would seem to me the only significant part of it was a reference to the fact that Begin had a terminal illness and that Sadat, really had no control over Egypt. Was that about the most significant part of that forgery ? Mr. RAMSDALE. That is true, why we highlighted it, aside from the simply quantitative analysis, was the fact that the Soviets had actually forged something saying it was by the Vice President. We thought that was an assault. Mr. PORTMAN. But you are dealing here with two very large figures, both with Sadat and Begin, and when the Vice President of the United States makes nasty and derogatory comments about both their physical health and their ability to control their country, from the Soviet point of view this was gaged to have considerable personal vendetta impact there, and therefore they were expecting, I believe, that these two figures would then very personally negatively react against the United States. Many of the forgeries are aimed at this knife thrust on a personal level. The field manual was something that was big and was available to be used time and again to prove the United States did these nasty things, but a lot of the Soviet forgery operations are very stiletto like. Mr. BOLAND. How quick is your reaction time to a forgery? Mr. PEEK. It would be within 24 hours if we get notified promptly, we can react -- if there is someone to react with, who will provide document, give it to us and allow us to examine it. Mr. ASHBROOK. When the Soviets produce a forgery or propaganda campaign, following up on my previous point, do you follow it where it blows back in the United States? Obviously Dr. Peek, or others, might go to the head of state or whoever is involved, but when it starts coming back to our country, aside from just the covert action, do you attempt to follow it as it filters back to our press? Mr. RAMSDALE. I think in that case, as I mentioned earlier, when we are aware of the forgery, we will alert the concerned governmental agencies that a forgery has taken place. Mr.ASHBROOK. That is the FBI. Mr. McMAHON. Yes, also the State Department, the Pentagon in the case of the manual, and I would assume they would follow it here in the United States if there was any need to. Mr. RAMSDALE. In the case of the FM 30-31, the Department of Defense made a public statement. Mr. McMAHON. But the answer is no, we would not follow it other than to alert the entities of government concerned here at the United States. Mr. ASHBROOK. In what cases would you alert the FBI on something coming back to the United States of that type. Would there be such a case? Mr. PORTMAN. There are two studies in our paper here on the anti-TNF campaign and the anti-neutron bomb campaign. Our studies here are entirely concerned with what the Soviets were doing in Europe and abroad. Certain things presumably were going on in the United States, too, and it is the responsibility of the Bureau to follow that. Within the context of these campaigns, when we have noticed a specific development, we have made an intelligence report to the Bureau and other people about it so they are aware of it. But as far as following Soviet covert action into the States, no. Mr. ASPIN. We are going to adjourn for a quick one down and vote. Mr. ASHBROOK. Mr. Aspin asked that we continue in the interests of time. He is coming right back up. So I will continue with a couple of questions. I noticed in particular on the peace conference in Philadelphia. that there were some members of the Communist Party from throughout the world who had come in. Does that put it in a little bit different context? Mr. McMAHON. No, sir. not as far as the covering of that conference. If we had such information, we would certainly report to the FBI that we had information to that end, that these people were travelling to attend this conference, but as far as what they did while they are here, that is the Bureau's responsibility. Mr. ASHBROOK. Well, for example, one of the main speakers was Mr. Chandra, who is president of the World Peace Council, which of course you have identified as the largest of the major Soviet front groups in propaganda campaigns. He is also a member of the Central Committee of the Communist Party of India. The fact that he was coming in for the founding of the American affiliate, this organization, does that interest you? Or are you interested in what he says? Mr. McMAHON. If comments made by him were published overtly, we would certainly follow it as far as whatever he said, but as far as covering his activities here or worrying about his activities, it would not be our responsibility. Mr. ASHBROOK. Well, I guess that is what I wondered, how you handle this. In your prepared statement you very clearly laid out what you called the objectives, the continuing objectives of the Soviet Union. No.9 is the United States is the main target of Soviet propaganda and covert action. You went through about eight major points. If a speaker would come in and in effect what he said was a part of continuing that propaganda and fiction against what you referred to as the main enemy, this country, you just kind of drop off, you don't worry that much about it? Mr. McMAHON. If there was not a public document which would permit us to hear or review what he said but the Bureau did cover it from their own concern about an agent of a foreign power, if there were foreign intelligence information in that document or in his statement, then the Bureau would disseminate that to us as foreign intelligence. But again, we would not pick that individual up until he was back overseas and follow his activities there. But a great deal of the Soviet covert action and propaganda program is devoted to counter or lessen U.S. interests worldwide. The large preponderance of it is worldwide because that is where the Soviets want to influence people against the United States. We follow this. As to the degree of Soviet influence in the United States, I would have to defer to the Bureau on that. Mr. ASHBROOK. Well, the one thing I was thinking, you are detecting the ebb and flow of their propaganda drive, their effort to influence world opinion. If at a U.S. Peace Council meeting like that, they had a number of representatives of Foreign Communist Parties, it would seem like what they say would be a barometer of whether it was that ebb period or that flow period, or an indication of a new all-out assault. They come in and say, one of the things we have to do is make sure the American people understand X, Y, Z. This may be a new propaganda drive. I guess one of the first things that I expressed an interest in when I went on this committee is how things seem to fall through the cracks in the floor and where one drops off, another picks up, sometimes it doesn't get picked up. It just seems to me that there is a continuity of interest there that constitutionally and otherwise you might be inhibited from following, but I am just wondering, out in the real world how you really do these things without things falling through the cracks. Mr. PORTMAN. Well, it works. For example, this last year there was a meeting of the World Peace Council Executive here in Washington, D.C., in which Boris Ponomarev came out -- he came to the United States ostensibly as the chairman of the Foreign Policy Committee of the Soviet Parliament and made an official visit here to this body, in fact, but that whole trip was engineered in order to allow him to be here with some of his colleagues in order to hold this meeting of the World Peace Council in Washington, something they had never done before. Well, we knew what was being planned, what it was, and we disseminated that information to the State Department, to the White House, to the Bureau, to tell them what was coming up and what it was about and what the idea was, and we got some after-action reports on it and these reports were also disseminated to the pertinent parts of the U.S. Government. What the WPC actually did here, we read in the newspaper, plus what information we got from the Bureau concerning whatever they had been able to cover on it. But our charter is not to keep following Boris Ponomarev and his friends into the States, and what they are exactly doing and saying while they are here. We keep track of their activities abroad; the FBI is concerned with their actions in the United States. Mr. ASHBROOK. To the best of your knowledge, in your opinion as responsible people in this field that we are studying now, then, your answer, and I assume that of others, is that it has worked and you don't feel like you are unduly inhibited from keeping abreast of all of the developments of the Soviet effort to subvert and propaganda in this country? Mr. McMAHON. Mr. Ashbrook, I think that it is important that the CIA devote its energies to the foreign targets and our activities be confined to overseas. What foreign Communists do in the United States is a question of national security. And certainly it is a valid responsibility for the the FBI. Now, we have good coordination and dialogue with the FBI. There are not many things that are not covered between us. Mr. ASHBROOK. Mr. Chairman, I would hope in future hearings we could some way or other have time devoted to the FBI's role, how they follow up on this matter of the Soviet effort to propagandize and influence within the United States. That basically would be the questions I have. I would think it would be appropriate and interesting for the record if we would include the conference agenda of the U.S. Peace Council, along the lines we were talking about, and the Covert Action Information Bulletin that carried the forgery, as part of the record. Mr. ASPIN. Mr. McMahon, let me ask you a couple of questions. It is still not clear to me -- I'm trying to get a fix on the relative magnitude of this, and I guess you have to say compared to what, but in the $3.3 ,billion covert action budget which the Soviets have, how is that broken down, and into what kind of things they spend their money on? Mr. McMAHoN. Well, as Mr. Boland mentioned, you have Izvestia, Pravda and the New Times, Novosti, Tass. Mr. ASPIN. Are those paid for entirely out of these covert action propaganda accounts? Is that what you are saying? Mr. McMAHON. Yes, sir. Tass is $550 million, and you have Novosti, which is another $500 million. Pravda we estimate takes about $250 million a year. Izvestia takes $200 million a year, New Times $200 million a year. Mr. ASPIN. So altogether we are talking about $1.6 million, for propaganda? Mr. McMAHON. Right, and then on top of that you have the Radio Moscow foreign service, which runs, by our estimates, $700 million a year. Mr. McMAHON. Then you have a variety of smaller activities such as the KGB foreign residencies, we estimate $100 million a year; the support to the national liberation fronts $200 million a year; the special programs, such as for the anti-neutron bomb, we figured that the Soviets put $100 million into that, and they put another $100 million into their counter TNF program. Then they have the support to the two different international departments under the CPSU which runs about $150 million. The press sections in the various Soviet embassies around the world spend, by our estimates, about $50 million a year. And then their clandestine radios, such as Radio Baku, runs another $100 million. So all added up, we have tapped for $3.363 billion. Mr. PORTMAN. These figures are not necessarily all that is spent, for instance, on Tass and Novosti. This is our best estimate; what is probably primarily devoted to foreign propaganda and related activities. Radio Moscow is a mammoth organization. They recently set up their world service. this does not take care of all of Radio Moscow. We are trying to approximate in dollar terms what they are doing. You can look at it from other ways to try to get a picture of the totality. For instance, in their placement of articles in foreign newspapers, a Mr. McMahon mentioned, the activities of the press sections of the foreign embassies, when an important document comes up or an official makes a speech, the Soviets will make a news handout abroad. Mr. ASPIN. Essentially, I guess, all this money is really propaganda related, isn't it? Mr. McMAHON. It is what we would term a covert action program. Mr. ASPIN. But its propaganda as opposed to some other type. Mr. PORTMAN. The first part of it is. When you get down to the KGB Service A, that is all covert action operations. Mr. McMAHON Agents of influence, the infrastructure associated with covert action. Mr. PORTMAN. And the CA operations by KGB foreign residencies also would fit this category. So, essentially what you are talking about is $150 million on covert action type activities that are not really propaganda, although some of it may have to do with press placements and so forth. Then you are talking in terms of front activities which again aren't propaganda always but are organizations and meetings and all that type of thing. So, I would say that probably you are talking in terms here of maybe $3 billion primarily propaganda, and maybe $363 million, just roughly breaking it down, as being more traditional covert action. Mr. ASPIN. And I take it that the forgeries play a larger part in the role of this Soviet propaganda activity. Mr. McMAHON. Yes; that is the case. Mr. ASPIN. Were the Khrushchev memoirs authentic? Mr. ASPIN. You had nothing to do with them, no doctoring, no changes? Mr. ASPIN. But in terms of the Khrushchev memoirs themselves, were they genuine, did that baby really come out of Russia? Do you believe that came off the pen of Nikita Khrushchev? Mr. PORTMAN. There is no question of CIA doctoring the memoirs. Mr. McMAHON. We were not there. Mr. PORTMAN. This came out through Victor Louis. Victor Louis is a witting collaborator of the KGB. He provided it. On the basis of the analysis which we did in the Agency, and on the basis of analysis which was done I believe at Colombia University by Time Magazine or one of these other firms that paid for it, it appears that in fact it is Khrushchev's voice on the recordings. As to whether the KGB or anyone else doctored some part of it, I can't say. All that I can assure you is that we in no way doctored it. Mr. ASPIN. How about the Khrushchev speech denouncing Stalinism before the whatever Presidium that was? Mr. PORTMAN. The Twentieth Party Congress. Mr. ASPIN. The Twentieth Party Congress. I mean, the claim has been made in several places that Mr. Angleton added several paragraphs to Mr. Khrushchev's prose. Mr. PORTMAN. The version which was made public was in fact the original version as we had it. It was not doctored. Mr. ASPIN. The one that appeared in the New York Times. Mr. ASPIN. That was the original, undoctored. Mr. PORTMAN. The speech was distributed by the Soviets to some of their own people and some of their allies and some foreign Communist Parties. So again, we can't be absolutely certain that every word in that speech was actually delivered at the Twentieth Party Congress, but the version that was made public was not amended or subtracted by the Agency. Mr. ASPIN. How about the version that was distributed by us in Eastern Europe? The allegation was that we added a few paragraphs and distributed a slightly different version than that which appeared in the New York Times, and got that into circulation. Did we doctor that a little? Mr. PORTMAN. No sir. There were various versions that were distributed by the Soviets in Eastern Europe which, from the copies that we saw, appeared to be the same as the one that was made public here in the States. Mr. ASHBROOK. I notice in your estimate, one interesting thing which follows the line of questioning I had earlier: Subsidies for foreign Communist Parties, $50 million. How much of that do you trace back to the United States? Mr. PORTMAN. You mean subsidies to the Communist Party of the United States? Mr. ASHBROOK. Yes; foreign Communist Parties. There was a time, I remember, in the Internal Security Committee, we have some testimony that the Soviet Union bought x number of thousands of copies of the Daily Worker which they paid for as an indirect subsidy,. Those of us who watch the Soviets know those kinds of subsidies. But what do you trace, or can you trace as a subsidy with that $50 million to the United States? Mr. PORTMAN. We did not trace any of it in our study. In some cases we know how much subsidies are paid by the Soviets to some foreign Communist Parties. I am not going to identify which ones they are. And on the basis of the size and significance of those Communist Parties and the abilities of other Communist Parties to make their own ends meet as far as their own ability to get funds, we have estimated that we think worldwide the Soviets in direct subsidies are putting into other Communist Parties. Mr. ASHBROOK. Well, again, that is one of those things that falls through the cracks that I was talking about earlier. If there is $50 million spent, if you are right there, it stands to reason from what you said that we are their main enemy, that a certain amount of it would be spent here. Now, after saying that, is there any interest in whether or not it really happens? Mr. McMAHON. Probably not since the Communist Party functions openly in the United States, and I am sure it can receive funds from anybody as long as they duly report it, by law. Mr. ASHBROOK. I hope that you do not accept the idea that the Communist party is a legitimate party. We have worked on this over a period of time and we know that they aren't. We have shown that they have direct money coming in from the Soviet Union, shown that they are really an instrument of Soviet policy. Even the Supreme Court pointed this out in the case of Communist Party v. S.A.O.B. I mean, you said we are in a real vital fight with these people. Has it ever occurred to us that if we ever put all the evidence together, another court would come to the same conclusion. But I suppose, with the rules we play, we don't ever think about it, except people like me. Mr. McMAHON. Well, again, I think your comment of talking to the Bureau on this point is the proper place to direct that question. We just cannot respond to it. Mr. ASHBROOK. So your testimony, Mr. McMahon, is that you pay attention to none of that. Mr. McMAHON. We do not trace any of it to the United States. Mr. ASHBROOK. But from everything you have said in your testimony, we are the main enemy, it is an important facet of their economic, military propaganda, and so forth. It would take all the intelligence that it takes to get out of the way of a moving locomotive to know that part of the $50 million finds its way here some way, I would guess. That is what I mean by things that fall between the cracks. I mean, every time I follow something, it falls between the cracks. I guess that is what makes me wonder. Mr. McMAHON. Well, I think you only have one player of a two-player game. We can get intelligence, and we can pass it on to the Bureau. What the Bureau does with it here m the United States is far beyond our purview of our responsibility, legitimately. Mr. ASHBROOK. There may not have been any of the follow-up by the CIA with the FBI, or you don't know it. Mr. McMAHON. We don't know. We turn it over to them and they have to react to it. Mr. ASHBROOK. This would be one of those areas that I mentioned in the previous question, again you have to say, well, maybe in that area it didn't. You just don't know. Mr. McMAHON. It may not. It is up to the Bureau to put their sources on what they feel are agents of foreign powers, and whether they are putting them on the KGB here, or on the Communist Party or Cubans, or what have you, we just don't get in that loop. We are not privy to that kind of information. Mr. ASHBROOK. OK. Well, that probably opened up as many questions in my mind as it solved, but maybe we can take those up at a later time. Mr. Chairman, that would be the kind of questions I would have with the caveat that I would like at some time after I look at this, to maybe go through some of these things again. But thank you for the information. Mr. McMAHON. We will be happy to do that. Mr. ASPIN. Let me ask you a couple of questions. On a couple of the areas of -- I am thinking of recent things that the Soviets might have taken advantage of if they were really on their toes and really running a red-hot propaganda operation. Is there any evidence that the Soviets had a hand in the perception, the misperception in the Islamic world that the United States was somehow behind the seizure of Mecca in Saudi Arabia, the thing that caused the embassies to be sacked? Mr. McMAHON. Right after that happened there were a series of reports that the United States was in back of that, and in fact we do know that on several occasions the United States was wrongfully accused of being anti-Islamic. Mr. ASPIN. Well, I am asking for the Soviet connection to that. I mean, I know that the word was out and that caused the riots. Mr. Mc,MAHON. Radio Baku played that theme. Mr. PORTMAN. If you shift to the attack on the Embassy at Islamabad, we can be more specific. Mr. ASPIN. Well, I thought that was the follow-up from that. But go ahead, talk about that. Mr. PORTMAN. In the case of the attack on the Embassy in Islamabad, there is no conclusive evidence that I am aware of that the Soviets specifically fomented or directed the attack. There is a good deal of evidence that they tried to exploit the situation after it occurred, and we have a number of reliable reports that various Soviets, in particular known KGB officers, tried to get two messages across. One was to convince American officials abroad, American diplomats primarily, that the attack on the Embassy was led by Pakistani Army personnel in civilian clothes. Second, to tell us that Pakistan therefore was an unreliable ally and that we should realize this. The Soviets passed a somewhat similar story in personal contacts, and this gets into the oral disinformation sphere that we covered in the paper. They passed similar stories to third country diplomats concerning the false "facts" that the Pakistani Government really was aware of the attack and was involved in it, and that the Pakistani Government purposely did not come in time to the aid of our Embassy. In each of these cases that I am aware of, we had a KGB officer passing these bits and pieces of comments. I would classify this as oral disinformation aimed at furthering Soviet interests in splitting the United States and Pakistan apart. Mr. ASPIN. How about the specifics of trying to stir up the Muslim world against the United States on the ground that the United States was behind the seizure of the mosque at Mecca? Mr. PORTMAN. As far as I know, that charge came out in the National Voice of Iran, which is a Soviet clandestine transmitter. There is no direct evidence that the Soviets were behind the attack on the mosque. Iranian spokesmen made some charges that the United States was responsible, but again, I am not aware of any direct evidence that the Soviets put the Iranians up to it. It appears as if the Libyans, the Iranians, and the Soviets all took the same line roughly, for their own reasons. Mr. ASPIN. I would have thought that the Soviets might have tried to exploit the hostage situation in Iran. Mr. PORTMAN. The Soviets have been careful, sir, as to what they have said and done openly on diplomatic hostage situations. They have their own embassies abroad which are somewhat vulnerable. With a lot of the terrorist attacks over the last few years, by various Arab groups and others, on diplomats, and aircraft hijackings, there is good reason to believe that the Soviets, particularly their field officers who feel themselves vulnerable, are, not really moving into that area. I wouldn't say that they never engage in manipulation of terrorists, but the body of information is that they aren't moving in to exploit diplomatic terrorist situations, for obvious reasons. Now, in the case of Afghanistan, we see all kinds of Soviet disinformation coming out. You see the stories that Amin was a CIA agent. A most recent example of Soviet disinformation occurred the other day when a Soviet Foreign Ministry official said that the DC-10 airliner that the Afghan airline bought a year ago was a gift from the U.S. Government. So there is plenty of disinformation. Mr. McMAHON. This ties in with the Soviet claim of Amin being our agent, but the Soviets have also, you know, recently identified 45 alleged CIA employees in Athens. But I think what took the wind out of a lot of the Soviet sails was the U.S. restraint in Iran, and that had a muting effect, I think, throughout the Islamic world. As time went on they began to think, maybe the United States is trying to work this out. Mr. McMAHON. You have got to remember the Saudis moved in quickly and disclaimed it. The Saudis identified who those people were. Mr. ASPIN. But not until two of our embassies had gotten sacked before that happened. Mr. McMAHON. But the Saudis made the statement early on that said that this is an internal Saudi problem. No other outside government is involved, and they literally sealed the country. Mr. ASPIN. No; I wasn't thinking of playing it in Saudi Arabia, I was thinking of playing it in the rest of the Muslim world. Mr. PORTMAN. One aspect of this that you have to take into consideration is the Soviet covert action system itself, which we have described as extremely centralized. Field officers are given very little leeway to take initiatives. Almost everything is considered at the center, in Moscow, and it is worked up in aspects of Soviet foreign security policy. So the Soviets are in a position to react and act quickly if it is something that is in their game plan. But if an event occurs out of the blue which doesn't automatically fit within the existing guidance game plan, there is no KGB chief of residency that is going to take an initiative, and it will take considerable time back in Moscow before the Soviets can go forward with something. In fact, that is one of the main reasons that this International Information Department was set up in 1978, when Zamyatin was taken out of Tass and brought in to head this new department, because the reaction time was too long and they weren't properly selling themselves abroad, they felt, and they weren't reacting properly to situations. As a result, the Politburo empowered Zamyatin and his first deputy Falin, who was for many years, Soviet Ambassador to Bonn, to make decisions on the spot. After that, you will recall, they had some press conferences with some American newsmen and some other ones in Moscow where they were prepared right on the spot to make decisions and comments, which was a situation which had not occurred that often before, but the Soviets haven't yet completely worked it out in the field, so that they can react equally well there. Always attempt to push the United States and its allies or friends apart. The line that came out after the Islamabad attack aimed at trying to preclude the United States and Pakistan from working together in the future. That they could handle, but the Arabian business was different and more difficult. Mr. ASPIN. Bill, do you have any questions? Mr. ASHBROOK. I just want to ask a question. Do you know Dimitri Simes? Mr. BENJAMIN. We know who he is. Mr. PORTMAN. Down at Ray Cline's institute downtown. Mr. ASHBROOK. It was about 6 years ago when he came over here. His specific information that he gave to us, was that when he was at the U.S Institute, he knew specific examples of subsidization of the American Communist Party by the Soviet Union. That is like one of those many things that falls through the cracks and never gets followed up on, and we all lean back and say we don't know anything about it. Where was a specific person who could tell about it, told about it, and again, that was in a Republican administration. It just seems like the same thing happens. Mr. ASPIN. I don't know, just keep voting those Democrats. Herb, you have some questions no doubt. Mr. ROMERSTEIN. Yes; thank you. You have indicated that Soviet overt propaganda and their covert propaganda are tied very tightly together. Why do they have such an ability to coordinate this? Mr. PORTMAN. The way the Soviet system works, you have essentially a Politburo member who can act for the whole, who is responsible, for overseeing an area, and when the Politburo wants to move on something. the designated Politburo member can move with full authority and cut through red tape, as Mr. McMahon was saying. If Boris Ponomarev, speaking in his role as the vice chairman of the Politburo's Commission on Foreign Policy -- which is headed by Suslov, but Suslov is an old man and is nearly blind and doesn't take an active role on a day-to-day basis -- if Boris Ponomarev wants something done, all he needs to do is call, let's say, the chief of Service A in the KGB and say he wants something done. That man is only going to refer this back to Andropov if it is a matter of some internal problem. But otherwise, he knows that Boris Ponomarev speaks for the foreign policy line and he will salute and do it because of the authoritarian system they have. Mr. ROMERSTEIN. In the international labor area, for example, a local Communist trade union, would be subsidized by the WFTU and could have important Communist world trade union figures come in to help them. Is that right? Mr. McMAHON. The Soviet Union spends $63 million a year on a variety of international organizations, just sustaining them for the purpose of propaganda and covert action. Trade unions would fit in here. Mr. ASHBROOK. What about the personnel situation? Are you getting good new people hired today? Mr. McMAHON. To that end, Mr. Ashbrook, we are doIng very well at bringing people on board. We are getting excellent career trainees, and it is interesting that they have an aura of patriotism about them that I haven't seen around the United States recently. I think the "me" generation is gone, but the young talent that we are getting on board are dedicated to the service of our country, and it is the most gratifying experience I have seen in years, and they are first rate, top flight people. Mr. ASHBROOK. And then you have got all those regulations, guidelines and everything else. Mr. McMAHON. And we trust the legislative branch will help us out on that end. Mr. ASPIN. Any other questions now? 28. The first specific forgery I will discuss is that of U.S. Army Field Manual FM 30-31B. (See Annex A-I p. 000-000.) This forgery deserves special attention, because it is a very sophisticated fabrication which the Soviets have exploited repeatedly in their overt and covert propaganda offensive against the United States. FM 30-31B contains a minimum number of errors in style, format and phraseology, and its authors used appropriate typewriters, paper and military jargon. The signature of U.S. General William Westmoreland was forged in the bogus document which carries a "top secret" classification. In the last detail, however, Soviet forgers slipped up, since genuine U.S. Army field manuals have never been so highly classified. Small errors such as this give away the bogus nature of even the most carefully executed falsification. 29. FM 30-31B purports to contain operational guidance to U.S. military security services regarding measures for influencing internal affairs of friendly countries where U.S. armed services are stationed and which are confronted by internal security threats from leftist and Communist forces. Thus, one "message" which the document's fabricators intended to convey to unwitting audiences is that the United States allegedly interferes in the domestic matters of governments whose internal stability is deemed important to U.S. national security interests. A special twist is given to the stability maintenance them in a section of the fabrication which asserts that in some dire cases the United States envisions the use of extreme leftist organizations to convince allies of the need to adopt harsher internal security measures. It is this second "message" which Soviet propagandists have seized upon to support outlandishly false charges that the United States acts as an agent provocateur behind various terrorist groups. 30. Mention was first made of the field manual in late 1975 in an obscure left-wing Turkish newspaper, but a copy of the forgery did not surface until a year later, when a facsimile was left at the Embassy of the Philippines in Bangkok, Thailand. Thanks to timely exposure by the U.S. government, the forgery was quickly put to rest. Then it suddenly reappeared two years later when a Cuban intelligence officer in Madrid began offering copies of the bogus document and a companion article based on it to Spanish publishers. The author of the article, Fernando Gonzalez, is a Spanish Communist who is known to have ties to both Soviet and Cuban intelligence officers. The forgery and the Gonzalez article were reprinted in the 18 September 1978 edition of El Pais and appeared again five days later in another Spanish periodical, El Triunfo.11 The immediate motive behind the 1978 revival of FM 30-31B was clear from the thesis of the Gonzalez article, since the author used the fabrication to support arguments that the U.S. is involved with various terrorist groups in Western Europe and in particular the Italian Red Brigades, which in March 1978 kidnapped and subsequently murdered Christian Democratic leader Aldo Moro. Within days of the Moro kidnapping, the Soviet propaganda apparatus had begun a campaign of suggestion and innuendo to falsely link the U.S. to this murder, but Moscow had enjoyed little success without "proof" to support its allegations. 11 El Pais: an independent, leftist publication, aspires to be the first national daily in Spain, poses as the vanguard of Spain's nascent political reform. Influential with top policy makers and politicians who are left of center or centerist. It has close ties to the Spanish Communist Party but is not party controlled. El Triunfo: a leftist, communist oriented weekly magazine. The Spanish Communist Party has considerable influence in the journal. "Let us note what another Italian journal suggested: There arises the suspicion that the 'Red Brigades' (or those who manipulate them in Italy) are pro-fascists organizations skillfully camouflaged as 'reds'. ... The abduction and subsequent murder of Aldo Moro could, in the logic of things, have been the result of the CIA's realization that the policy pursued by that statement was dangerous. A few months later this was confirmed by a secret document which appeared in an October issue of the journal L'Europeo.12 It bore the signature of US General Westmoreland and said that US special services should use 'leftist' outfits in 'friendly countries' to promote the interests of the United States." 12 L'Europeo: independent left-leaning magazine in Italy with national distribution. Has some appeal among radical intellectuals. Influential with some academic leaders. Frequently sharply critical of the United States. A. Date, Place and Method of Surfacing. -- A Turkish newspaper, "Baris," mentioned a field manual FM 30-31 (which actually exists) in its 24 March 1975 edition, but did not reprint a facsimile of the document. In September 1976, a photocopy of the bogus FM 30-31B was left on the bulletin board of the Embassy of the Philippines in Bangkok, Thailand with a cover note from an anonymous "concerned citizen." This is a typical Soviet bloc practice. Surfacing attracted little attention. FM 30-31B reappeared in 1978 when it was reprinted in two Spanish publications, "El Pais" (18 September) and "El Triunfo" (23 September). This was the work of a Spanish communist and a Cuban intelligence officer. Since 1978, the manual and/or articles concerning it have appeared in the world press in more than 20 countries, including the United States. B. Format. -- U.S. Army Field Manual 30-31B, "Stability Operations-Intelligence," bearing forged signature of then Army Chief of Staff General Westmoreland. Note: Genuine field manuals FM 30-31 and 30-31A exist, but FM 30-31B is a total fabrication. C. Content. -- Purports to give guidance to Army intelligence regarding interference in host country affairs, subversion of host country officials and military officers and asserts th the U.S. envisions "the use of extreme leftist organizations to safeguard the interests of the United States in friendly countries where communists appear close to entering the government." D. Purpose. -- To reduce U.S. foreign military presence abroad by raising host country suspicions regarding American interference in their internal affairs also used to suggest the CIA plays a similar role in military intelligence. E. Media Replay and/or Government Inquiry. -- As noted, replay in both communist and non-communist media has been extensive. In particular, Soviet propagandists have exploited this forgery by claiming that it adds plausibility to allegations that the United States was involved in the March 1978 kidnapping and subsequent murder of Italian Christian Democrat leader Also Moro by the Red Brigades. Several foreign governments have made inquiries. F. Comment. -- FM 30-31B will probably be around for some time. In summer 1979, the Soviets prepared Portuguese-language copies of the forgery and covertly circulated them among military officers in Lisbon. STICKING IT TO THE "HOST COUNTRY"
In April 1975 a Turkish newspaper, Baris, carried an article about an arcane, but unclassified United States Army Field Manual: "FM 30-31, Stability Operations-Intelligence," dated January 1970. The article mentioned a mysterious Supplement B to this Manual, and hinted that future articles would discuss that Supplement. Not another word about the Manual or the Supplement appeared in Baris; the reporter who had written the article disappeared, and no one would talk about it. In September 1978, the Madrid magazine Triunfo published, in Spanish, the full text of Supplement B. There was no comment from the U.S. Embassy. Shortly thereafter, articles about and excerpts from Supplement B appeared in Italy and the Netherlands. Before the first article appeared in the well-known Milan-based L'Europeo, its respected publisher, Giovanni Valentini, received a call from a high official of the U.S. Embassy in Rome, who stated that publication of the document would be "inopportune." When L'Europeo was undeterred, the Embassy wrote the magazine stating that the document was a forgery, and it was hoped the magazine would "be spared the embarrassment" of publishing a document whose authenticity had been officially denied. The letter stated: "The article published in Triunfo assumed the existence of a 'supplement' to U.S. Army Field Manual 30-31, an unclassified publication. Such a supplement has never existed." The denial is significant because the Army admits the existence of a secret Supplement A. A copy of the original, English-language Supplement B has been obtained by CovertAction Information Bulletin, and is published in full below. In order to understand and analyze it, one must understand a bit about FM 30-31 itself. The Manual, which can be found at most military libraries, is an enlightening guide to imperialist military operations. It describes in minute detail the methods of liaison with intelligence services in foreign countries where U.S. troops are stationed, so-called "host countries" (HC). It is based on the premise that host countries are friendly to U.S. interests and must be kept that way. The greatest threat to that friendship -- short of external war -- is "instability," and one of the greatest causes of instability is "insurgency." Consequently, the Manual describes insurgencies, how they develop and how they grow; it assess the vulnerabilities of insurgencies, and explains how Army intelligence operations, working with the host country intelligence agencies, can counteract those insurgencies and promote "stability," i.e., continued support for U.s. interests. The Manual describes insurgent capabilities and vulnerabilities, and outlines intelligence requirements regarding such movements. It discusses how to work with host country intelligence services, how to plan, collect, process and disseminate intelligence information. It also discusses intelligence training, gives examples, complete with filled-in sample notes and forms, of intelligence collection, and gives the course outline for a model intelligence training program. A good example of typical military thoroughness is the Appendix on "Insurgent Activity Indicators." Nearly a thousand separate indicators are listed, ranging from "murder and kidnapping of local government officials," (a rather good indicator that some trouble is brewing) to "increases in purchase and use of radios" (a bit less conclusive), to "appearance of questionable doctrine in the educational system" and "increase in bank robberies." Much of the Manual is subject to ridicule as representing stereotypical cold-war paranoia. The description of "the typical Communist insurgent organization" is absurd in its precisions. Party structure is "cellular." Party members belong to a "Party cell" and to a "functional cell." Party cells contain from three to seven members, one of who is designated "cell captain." The charts are mind-boggling. They rival some of the publications of the extreme right National Caucus of Labor Committees. But there is a falsely harmless tone to much of the Manual. It notes that "a fundamental premise of U.S. internal defense policy is that U.S. assistance will be channeled primarily through the HC structure." This is the premise which Supplement B belies. Supplement B makes abundantly clear that it is U.S. policy to work behind the backs of the host country military and intelligence agencies, indeed of prime importance to infiltrate them. The introduction notes that FM 30-31 was "limited to matters directly concerned with counterinsurgency and with joint U.S. and host country (HC) operations to secure stability." It continues, "FM 30-31B, on the other hand, considers HC agencies themselves as targets for U.S. Army intelligence." 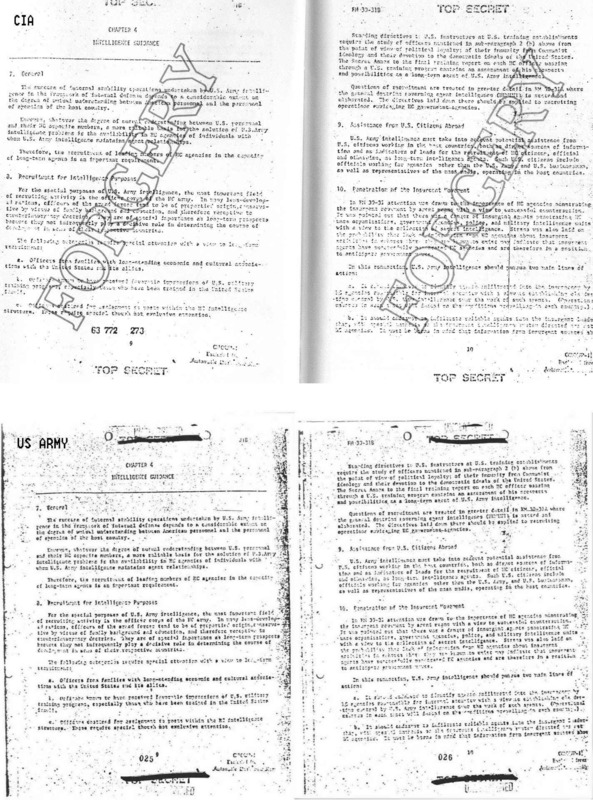 And that is the special charm of this "Top Secret" document: while the Field Manual sets forth procedures for cooperating with host country agencies in a mutual effort to counteract local insurgencies and maintain stable regimes, the secret supplement explains that all the while the U.S. Army will be actively attempting to infiltrate the agencies they are supposedly assisting. The candor of the supplement is refreshing: "The U.S. Army, in line with other U.S. agencies, is not committed irrevocably to the support of any particular government in the host country for a variety of reasons." And this most chilling appraisal: While joint counterinsurgency operations are usually and preferably conducted in the names of freedom, justice and democracy, the U.S. Government allows itself a wide range of flexibility in determining the nature of a regime deserving its full support. ... U.S. concern for world opinion is better satisfied if regimes enjoying U.S. support observe democratic processes, or at least maintain a democratic facade. Therefore a democratic structure is to be welcomed always subject to the essential test that it satisfied the requirements of an anti-Communist posture. If it does not satisfy these requirements, serious attention must be given to possible modifications of the structure. So much for the noble American commitment to democracy. Chapter 3 explains just how U.S. intelligence interests should focus on host country military and police organizations, and how they should be prepared to "put pressure on groups, agencies, or, in the last resort,on the HC government itself," if any aspect of the host government appears "vulnerable." And, as the Supplement explains, "Official action is not relevant to the issues discussed in this document. But unofficial action involving clandestinity falls into the sphere of responsibility shared by U.S. Army intelligence with other U.S. agencies." Chapter 4 pinpoints the best recruitment and infiltration targets -- particularly military officers. That the recruitment of agents within host government agencies of all kinds is a task of U.S. Army intelligence is one of the shocking revelations of the Supplement. That it might assist the CIA is one thing; that it might give its opinion on likely recruits is one thing. But that it engages in this activity on its own is something else. In addition, it is in this chapter that reference to Supplement A is found. That document, it appears, provides general doctrine, guidance and directives for the recruitment of agents in general. And recruitment and infiltration are not where it ends. Section 11 speaks of "special operations." When the host country government does not react with adequate "vigor" to the threat of subversion, U.S. Army intelligence "will convince HC governments and public opinion of the reality of the insurgent danger" by using their infiltrators to "launch violent or nonviolent actions according to the nature of the case." Where there is insufficient infiltration of the insurgent group, "it may help towards the achievement of the above ends to utilize ultra-leftist organizations." The actions contemplated, "those described in FM 30-31 as characterizing Phases II and III of insurgency," including terrorism and outright warfare. The irony in this sanctioning of agents provocateur is that the host government is to be "convinced" of the "reality" by resort to false provocations. This, as we know, has been a favorite tactic of the CIA; there is no reason that military intelligence, if also in the dirty tricks business, would not use the same practices. The last paragraph indicates the importance ascribed to archives. If HC archives are not legally accessible, "operations" to gain access are suggested. When the document was referred to in Turkey, there was no response from the U.S. When it was published in full in Spain, there was no response. When the Embassy heard that it was to be published in Italy, they informed the publisher of a major magazine that it would be "inopportune" to do so, and when it appeared that it would nevertheless be published, the Embassy announced that the document was a forgery -- in a letter which said there was "no" supplement to FM 30-31, a statement which was itself untrue. It is hard to imagine that the document is not genuine. The format, style and classification stampings appear consistent with other military supplements, and the document is filled with authentic military phraseology. If it is a forgery, why did it not come out in 1975? If it is a forgery, why did a high Embassy official describe its publication as "inopportune?" Military intelligence veterans who have, at CovertAction's request, looked at a copy of the document, all say that it appears genuine. Of course, the government could declassify Supplement A. If it has nothing to do with the recruitment of agents, then the document is surely a forgery; but if it does? Regardless of the dispute, we believe, as do publishers in several other countries already, that the document is real, and that in any event our readers should see it and decide for themselves. In the unedited document that follows we have eliminated the table of contents, and, at the bottom of each page, "Group I, Excluded from Automatic Declassification."